Forgot I had a program from the Wings' inaugural season. Usually I try to go in chronological order with particular teams, but we'll bend the rules with this team. The Adirondack Red Wings joined the American Hockey League for the 1979-80 season. 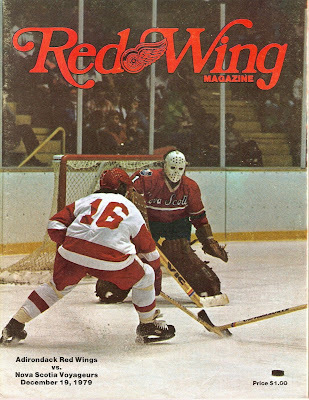 The franchise was originally the Tidewater/Virginia Red Wings that suspended operations after the 1974-75 season. The team was the primary affiliate of the Detroit Red Wings (hence the name and unis), replacing the defunct Kansas City Red Wings of the CHL. They were owned by Bruce Norris, then NHL Red Wings owner. The team played it's home games in the Glens Falls Civic Center, a 4,794-seat arena built just before the team arrived. The franchise's first GM was former Detroit coach/GM Ned Harkness, who was also GM of the Glens Falls Civic Center. Originally, the team was going to be coached by former Red Wings forward Larry Wilson. Tragically, Wilson died of a heart attack before the season began. The Red Wings quickly filled the void by promoting Kalamazoo Wings head coach Bill Purcell to Adirondack. Purcell was coming off a Turner Cup Championship with the K-Wings and a 40-28-12 record in his first season there. The expansion Red Wings stumbled in their inaugural season, going 32-37-11. Their 75 points were good enough for fourth place in the AHL's North Division, just one point better than last-place Springfield and 22 behind first-place New Brunswick. Adirondack was sixth in the AHL that year on offense, with 297 goals scored. Leading the pack was Rick Shinske, who scored 22 goals and 80 points. Five other players notched at least 20 goals that year, including Mal Davis' team-leading 34. On defense, the Wings were fourth-worst in the AHL, surrendering 309 goals. Future NHLer Al Jensen, who followed Purcell from Kalamazoo, played in 57 games that season, going 27-24-5 with a 3.51 GAA and two shutouts. Claude Legris and Wayne Wood were his two backups that season. Purcell didn't make it through the season, getting fired in favor of co-coaches Tom Webster and forward JP LeBlanc. The Wings did make the postseason in Year One, but were blown away by New Brunswick in five games in Round One (best-of-seven). Despite the so-so season and turmoil behind the bench, the Wings were a smash hit in Glens Falls. Adirondack was second in the AHL in attendance, averaging 4,930 per game. The inaugural season of the Wings had a few players of note. Rookie John Ogrodnick split time between Glens Falls and Detroit, and would go on to a splendid 15-year NHL career, mostly with Detroit. Al Jensen made it to the NHL, but spent most of his career with Washington. Jensen won the Jennings Trophy in 1983-84 with the Capitals and spent parts of eight seasons in the big leagues. Then there was Ted Nolan. Nolan spent the majority of his career in the AHL, appearing occasionally in Detroit before retiring in 1985-86. He went on to coach in major juniors and the NHL, winning three championships in the OHL and QMJHL. He also won the Jack Adams Award as Top NHL coach with Buffalo in 1996-97. Nice program, 64 pages with mostly black and white pictures. Lots of ads and several articles. BTW, the Red Wings broadcast crew included Dave Strader, who was "called up" to Detroit in 1985-86.